President Donald Trump hinted late Wednesday that three Americans detained in North Korea could soon be released as he prepares for a potential summit with North Korean leader Kim Jong Un. “As everybody is aware," Trump tweeted, "the past Administration has long been asking for three hostages to be released from a North Korean Labor camp, but to no avail. Stay tuned!" Trump's prospective meeting with Kim comes after last week's historic summit between Kim and South Korean President Moon Jae-in. Trump’s new national security adviser, John Bolton, earlier said that releasing the Americans — Kim Hak-song, Kim Dong-chul and Kim Sang-duk, who also goes by Tony Kim — would be a “demonstration of their sincerity" in the lead-up to the summit. Relatives of one of the men said they are “hopeful” amid the unconfirmed reports that they could soon be released. South Korean media reports quoted a local activist as saying North Korea had relocated the trio from a labor camp to a hotel on the outskirts of Pyongyang. “We cannot confirm the validity of these reports,” a State Department official said. Tony Kim, 59, was detained at Pyongyang Airport in April 2017 as he was preparing to leave the country. The Korean-American accounting professor had been working at the Pyongyang University of Science Technology, an institution privately funded by Christian groups in the West. The other detainees are Kim Hak Song, who was also working at the Pyongyang Science and Technology University and was held in May 2017 for "hostile acts against the republic," and Kim Dong Chul, who was sentenced to 10 years in prison with hard labor in April 2016 for espionage and subversion. 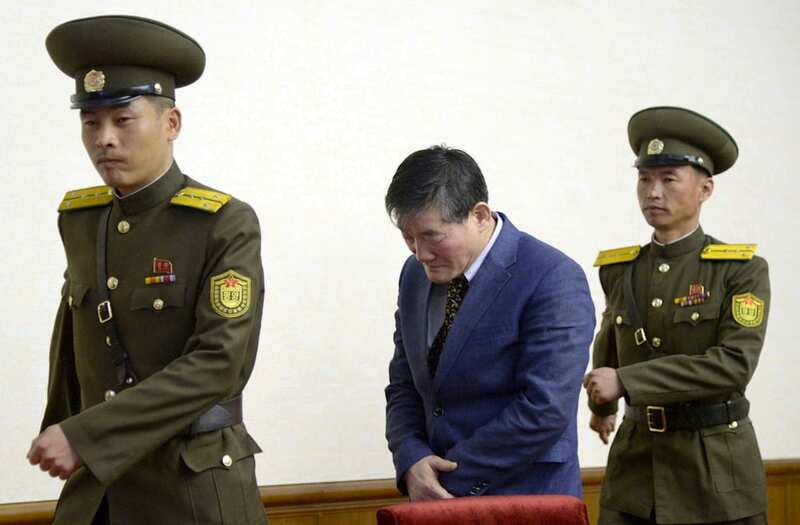 Reports of their possible release come after the U.S. slammed the North Korean regime over human rights. In a statement marking North Korea Freedom Week, an annual event used by South Korean and international activists to raise awareness of abuses by North Korea, State Department spokeswoman Heather Nauert said: “We must not forget the millions of North Koreans who continue to suffer under one of the most repressive and abusive governments in the world. “For more than 60 years, the people of North Korea have faced egregious human rights violations in virtually every aspect of life. In addition to the roughly 100,000 individuals, including children and family members of the accused, who suffer in political prison camps, North Koreans face an almost complete denial of fundamental freedoms by their government." Detaining — and then releasing — U.S. citizens has in the past given Pyongyang leverage in negotiations with Washington. North Korea last year released Otto Warmbier, the 22-year-old University of Virginia student who was convicted of “hostile acts” in 2016 after visiting Pyongyang. However, he was so weakened by his time in a labor camp that he died days after returning to Ohio. The North Korean mission at the United Nations did not respond to requests for comment. Separately, United Nations Secretary-General Antonio Guterres said Thursday said he was optimistic about the prospects for progress on the issue of North Korea's nuclear programme after recent diplomatic moves. "I am optimistic ... I think now things are on track for a meaningful negotiation," he told the BBC.